The Gold Peak The Taste that Brings You Home at Golden Corral Sweepstakes is open only to legal residents of the 50 U.S. (or D.C.) who are 18 years of age or older. The Gold Peak The Taste that Brings You Home at Golden Corral Sweepstakes ends at 11:59 p.m. ET, November 25. 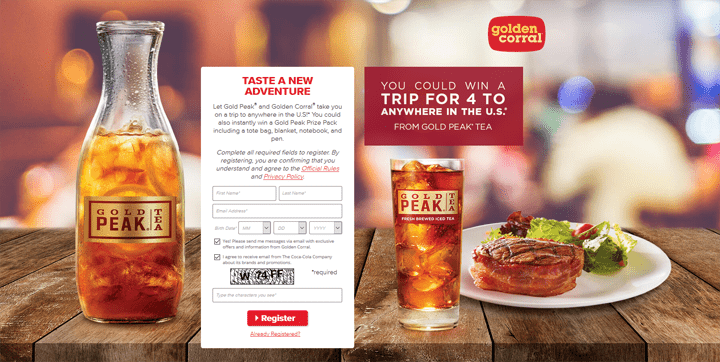 During the period, visit goldencorral.com/goldpeaktea and follow the links and instructions to complete and submit the registration form, including providing a valid email address. Limit 1 Sweepstakes entry and 1 Instant Win Game play per person per day. 1 GRAND PRIZE: A Visa Prepaid card that may be used for a trip “home” within the 50 US, terms and conditions apply. Approximate Retail Value (“ARV”): $3,000. 233 FIRST PRIZES: A Gold Peak Prize Pack consisting of a tote bag, a pen, a notebook, and a blanket, all details determined by Sponsor, in its sole discretion. ARV: $50. Total ARV of all prizes: $14,650.